The churchyard has been in continuous use since at least 4000 BC. The number of burials has left it significantly higher than the High Street.The churchyard contains six Grade II listed chest tombs, situated at the south-east corner of the church. The lych-gate was erected to commemorate Queen Victoria's Golden Jubilee in 1887. Among the many local people buried here are Captain George Upton-Robins, hero of Hill 60 in World War I (May 1915), several members of the Lattimore and Sibley families, and Sir William Beach, a former owner of Wheathampstead House. 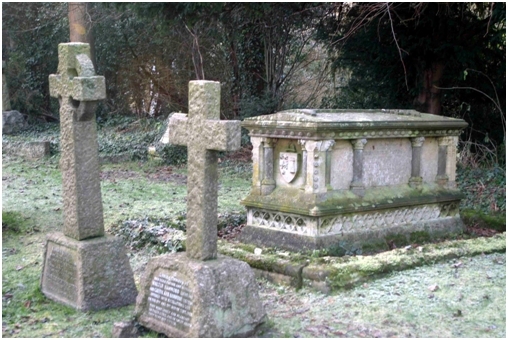 The grave of the Cherry-Garrard family, in the north-west corner of the churchyard, is of particular interest. The main inscription is to Apsley Cherry-Garrard, a distinguished soldier and father of Apsley Cherry-Garrard (1886-1959), a member of Scott's Terra Nova expedition to the Antarctic in 1910-1913 and author of 'The Worst Journey in the World'. His inscription is on the back of the stone cross that marks the grave. He lived at Lamer House, in the north of the parish. The War Memorial that stands facing the High Street lists the names of the men of Wheathampstead who died in the First and Second World Wars. Local historians are researching the backgrounds and families of every man listed on the Memorial.